Looks as though they knew we were coming! We were last here 11 years ago, when Petra featured highly on our list even though we didn’t really know quite what to expect. This morning, we knew exactly what lay in store for us and couldn’t wait to share the experience with Edward and Amy, who we felt sure would feel as enthusiastic as we did. Some things hadn’t changed. There were still a few touristy souvenir stalls, some of which featured Indiana Jones (though possibly not quite as many as we remembered - those films are a bit old hat now aren’t they?) But now, instead of being housed in rickety stands, here they featured as part of the new gateway centre and were all rather more pukka than before. Mo took the opportunity to outline his plans for the day, pointing out places of interest where he felt we might focus, places that were open to us if we felt adventurous and possibly most important, where we were to eat lunch. As he did so, I looked at that map and wondered if I was interpreting it correctly. Maybe the symbol I was looking at meant something else here - a viewpoint perhaps or a place to take a great photo? 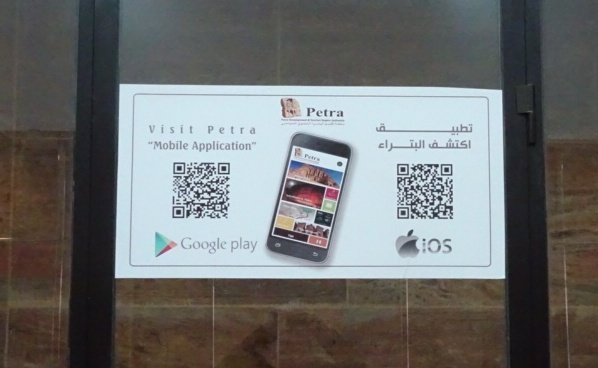 But no, the world has moved on in the last eleven years but Petra has moved on too and yes, those really are free wifi hotspots! My word…. There’s even an app to download - not that we had time -or need - for that, for Mo was already stepping out and we must keep up. I couldn’t quite catch up with the two policemen going on duty however. We made a stop by each of the interesting archaeological features along the way and Mo explained what we were looking and and why it was important. All the time, however, he had an eye on the time, the weather and the number of people making their way through the Siq, for his main concern throughout was that the four of us would have the best experience possible whilst we were here. Right now, the light was great - blue sky and sunshine - but it wasn’t going to last according to the forecast, so we needed to press on. But that didn’t mean we should miss out on anything, including a quick look inside this small shop where a burner was creating the immediately recognisable scent of this country - a blend of frankincense and myrrh. Firstly, we passed around a large lump of frankincense - solid tree resin that bore a remarkable similarity to the rosin I used on my violin bow - slightly sticky, rather light in weight and with a very distinctive aroma. Next, the rather darker, more lumpy myrrh, with an equally distinctive but rather different fragrance. Lastly, something I would not have recognised at all from its appearance and yet immediately knew the scent - of wardrobes and some perfumes. That small piece of white resinous stuff is sandalwood. 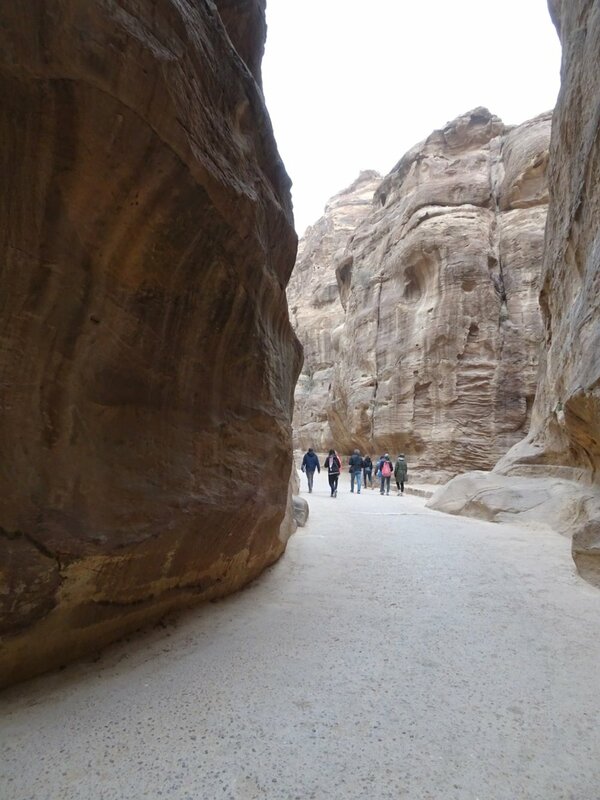 That little learning opportunity complete, we continued down the Siq, making our way through a series of narrow passages, doing our best to avoid the skittering horses which were pulling small carts for those who preferred not to walk. The smell as they passed by was far from fragrant - where was that incense when we needed it? As we travelled further down the Siq, we came across some familiar sights from our previous visit including this man and his camel. We marvelled at the fantastic details - the sandals, the folds in the fabric and the very “camel-ness” of the camel - they are still here and will hopefully remain for another thousand years or more. We noticed too that the colours of the stones were becoming darker, richer and more varied. Suddenly, we were almost there. 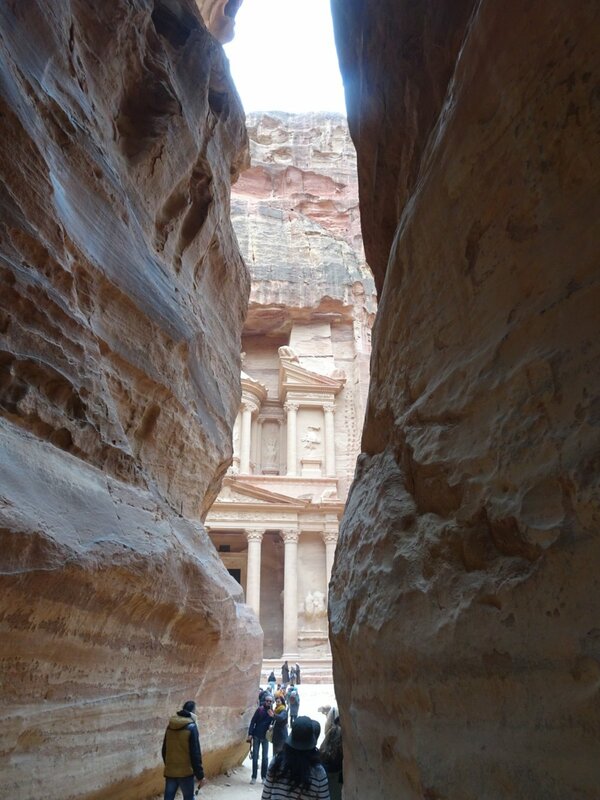 There was light at the end of the tunnel and we caught a glimpse of the Treasury, which for most of us, is the symbol and most recognisable feature of Petra. A few steps more and we were there in front of it, and yes, it was just as spectacular as we remembered. Here was quite a gathering of people, camels, horses, donkeys and shopkeepers, each with their own agenda. It was surprising to see quite so many people there, for few people had passed us along the way. But a place such as this is somewhere to savour, to linger and most certainly somewhere not to rush through and we were glad that the pace of activity around here was exactly so. Having spent time looking and learning about the Treasury, we made our way to the right, along the Street of Facades, taking photos the whole time all four of us, with phones, cameras, Instax…everything was so photogenic and we didn’t want to miss a thing. Meanwhile. Mo was keeping an eye on the weather for those blue skies were fast being covered by a thick layer of cloud. We were starting to feel pleased that we’d taken Mo’s advice to wrap up warm. The whole way, we were repeatedly asked if we wanted to ride rather than walk, though quite why we’d have chosen to trot on past all of this is a mystery. We actually wanted to spend as long as we could taking it all in. There was so much to see and Mo had so much information to share with us. 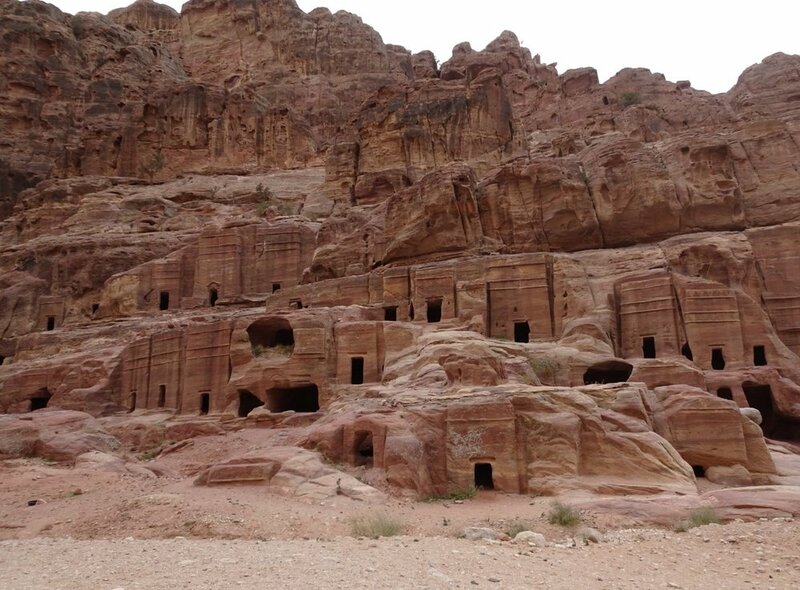 On both sides of the pathway there were the remains of tombs cut into the sandstone, some with elaborate carvings eroded by the wind and weather. All the way along here the spectacular colours in the rocks were attracting my attention. At this point, Mo suggested we climb up over a few rocks into a cave high above the pathway. “It’s quite safe and fairly easy” he said - though nothing less than a solid staircase would have persuaded me to go up there! So as everyone else went up to take a closer look, I simply used my zoom lens to capture the colours in the ceiling of the cave. Fab, aren’t they? It also gave me time to take a few more photos of the patterned rocks below - some stripes and swirls of a really remarkable range of colours. Sadly, it did mean I didn’t get to meet the donkey that lives in the cave up there though. The elaborate structures carved into the rocks the whole way along here confirm that Petra is so much more than just the familiar Treasury facade. This second visit gave us the opportunity to see far more than we did previously and I have no doubt that any subsequent visit would reveal still more detail. By now, though, the sandstone sides had opened up and a broad road spread out ahead of us. This could have been a colonnade of shops and there at the end of the pathway was a large gateway similar to the one we’d seen in Jerash the other day. The remains of temples were to be seen around here too, for this was the “city centre” originally. There is a great deal of further excavation to be done but for now, it was time for lunch! Just around the corner was The Basin, a small hotel-operated restaurant offering a tasty buffet and clean loos - priorities eh? Comfortably stuffed, we made arrangements to meet Mo tomorrow morning, because we were going to make our own way back, spending as long as we wanted in the site. Actually, we could return for sunrise tomorrow morning too if we wanted, for our tickets were valid for “one day overnight” but right now, we preferred to complete our Petra experience today. Edward and Amy decided to follow Mo’s recommendation to take a side path past the Temple of the Winged Lion and the Church to the Palace Tombs. My Hero and I took a look at the incline of that path and chose to return by the same route as we had taken here earlier. For a while we walked in parallel, they were walking high above us on a pathway on the hillside and we waved and took photographs for a while until we turned the corner and left them to find their own way home. We greeted the camel, taking shelter in a cave by the side of the path as the weather began to deteriorate rather. A breeze was getting up and it was getting a little dark over there. We hoped that the youngsters would be ok and wouldn’t get caught in a rain shower. 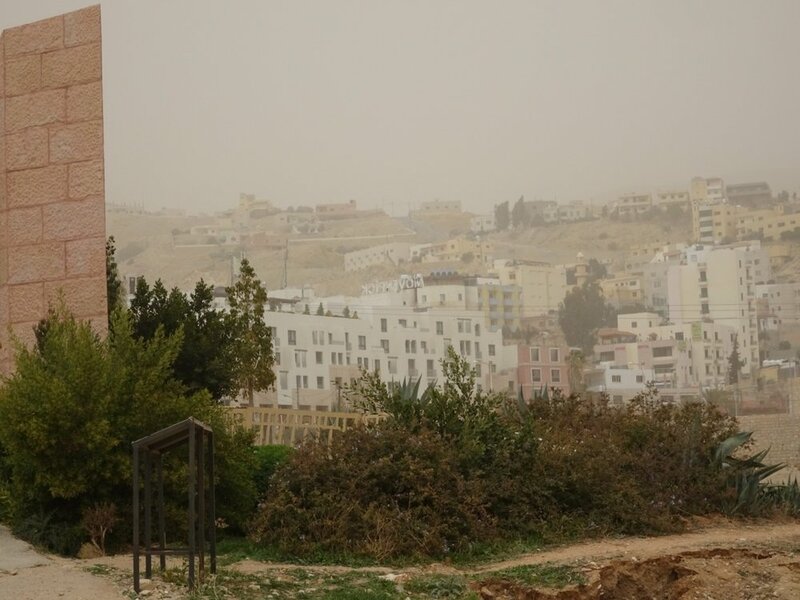 Down by the Treasury, the wind was whipping up small sandstorms, requiring full use of scarves and sunglasses to protect us from the flying sand. Business had all but dried up on the souvenir stands and some were closing, hurriedly taking in the goods on display before they were blown away. The heavier objects were going nowhere and simply acquiring another layer of dust - like us! We like nothing better than to sit and people watch for a while and a bench proved to be the perfect place to gather our thoughts and rest the weary knees a while. It was now 2pm or so and the afternoon visitors were beginning to appear. I was intrigued by this gentleman, smartly dressed in traditional Bedouin clothes including the sheepskin coat and khol eye makeup. He didn’t seem to be doing a great deal at all and yet he appeared busy. Was he a supervisor of camel handlers? An undercover policeman? A man of mystery! We could put off the walk back down the Siq no longer and we made our weary way along the pathway, avoiding the ponies as before, knowing that however tired we were, nothing would persuade us to take a ride back instead. I can’t tell you how glad we were to catch sight of our hotel there by the gateway! We had plans to return to the entrance to Petra this evening for dinner, but as we were having a drink in the bar first, the news came that it was snowing outside. A quick check confirmed the weather as being too nasty to venture out unnecessarily and so we chose to stay in and eat here in the hotel instead. A series of short power cuts all evening followed by some startling action with the air conditioning system (prompted by a sandstorm outside, we were told) has made for a fun time, but the lively conversation and a plate of our favourite Zürcher Geschnetzeltes proved to be the perfect alternative. We will sleep well tonight!